This “sacred” topic for North and South Koreans is in the epicenter of international attention again. There was a time when the northerners were more initiative on this issue, and the southerners were apprehensive about “communization” from the North. Now, in a radical shift of the economic power factor in favor of South Korea, according to many experts, North Korea is concerned more about self-preservation than about global projects of reunification. However, in recent years this problem has sounded very loudly again. This time Seoul is playing a leading part. Interested readers remember, that one of the stated priorities of South Korea’s current government has been the task of creating trust between North and South. However, three years later, analysts decided that this target has been replaced in practice by the policy of forcing the union through the acceleration of “collapse and regime change” in North Korea. Today, most of the discussion in South Korea centers has the topic what and how Seoul should do after the reunification: how to repair the destroyed economy, which principles (South Korean or international) should guide the legal aspect of the “attached” territories and how to carry out justice against the “criminal” leadership of the current North Korea. Many researchers think this statement to be, at least, a premature attempt to “cook a hare before catching him”. However, this is the reality of the current discourse of the South Korean political elite. Back in March, 2014 the President of South Korea, Park Geun-hye, being in Dresden, said in a keynote speech, where on the background of seemingly attractive proposals for Pyongyang the idea of reunification was gradually carried out and was based on “the German version”, so the reunification of Korea by absorption of the North by the South (and in the Korean language version of the speech the term “absorption” was clearly stated). Dresden itself, which is located in the absorbed the German Democratic Republic, was chosen to host a keynote speech by Park Geun-hye for a reason. Another confirmation of this phenomenon is the global “Eurasian initiative”, announced by the President of South Korea, Ms. Park Geun-hye in November 2013. Obviously, this initiative is a new mega project, which is designed for a much wider area than just East Asia. According to the Speaker of the South Korean government, “the main purpose of the mega project is the creation of “a giant wave” of peace and prosperity in Eurasian societies, which will arise in Europe, Southwest Asia and the Middle East as a reason for the restructuring, opening up and renunciation of nuclear weapons by North Korea as well as the improvement of human rights in the North. We can use the Eurasian countries as a lever to persuade North Korea. However, if Pyongyang refuses, we will increase the pressure on North Korea – this is where the line of Eurasian prosperity breaks out – to connect the Eurasian line with North Korea by force. Can Pyongyang stop the “locomotive” of Eurasian society which is the fundamental revolution of world history? Today, this debate between the officials of the two Koreas continues to gain momentum. North Korean scientists also gave their response. In the February, 2015 report by the Institute for Disarmament and Peace of the Foreign Ministry of North Korea, the necessity of an objective evaluation of the realities that exist on the Korean peninsula is emphasized. And today they are such that “for 70 years, the two Koreas have been developing along different trajectories determined by opposing ideologies and political systems. At the same time, neither of the Korean sides is willing to give up their own ideology and political system. Therefore, the desire of one party to impose its system on the other is sure to lead to war and the involvement of neighboring states in it. Given the characteristics of the military capabilities of both the Koreas and their neighbors, the result of attempts to implement such a scenario would be a “catastrophic Armageddon”, with which the tragic consequences of the Korean War of the 1950s, the current military conflicts in the Middle East and Ukraine would pale by comparison”. On the basis of the conducted analysis the North Korean author concludes that the coexistence of the two systems is the only realistic way for the reunification of Korea. The differences between the systems are not an “Achilles heel”, but rather the reason for the necessity of their coexistence. 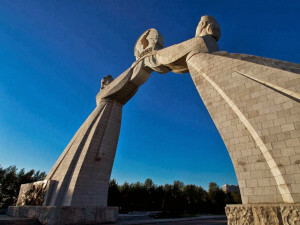 If the two Korean sides were to reunite in one state and begin to respect the unique features of their respective political systems, then the inter-Korean cooperation could develop smoothly and achieving the ultimate goal of reunification would cease to be an issue. Here, we believe it is appropriate to pause and give the reader an opportunity to assess the current approaches of both Koreas to the actual problem.